Samuel Freeman is pleased to present an exhibition of new work by Portland-based Ben Buswell paired with a special courtyard installation by Mineo Mizuno. Ben Buswell begins with images of the Pacific Northwest as the departure point for his embellished, multi-dimensional sculptural reliefs. “I am a native West Coaster and like to think of our geographical edge as the literal end of Eurocentric history.” Through cutting, etching and tearing, Buswell interferes with the original surfaces of his mediums, “wounding” stacked paper reliefs or scratching into the pristine surfaces of glossy Lambda prints. These physical transformations create new hybrid forms that hover somewhere between the original representations and the places depicted. Landscapes are altered and made almost unrecognizable, while new images rise up through previously flat picture planes. Delicately shredded photographs take on new forms and interpretations with cascading tendrils. These methods, both additive and subtractive, bestow new meanings on the original subjects while partially removing them from history. In Buswell’s work the photographic illusion of a static eternity is shattered and the preservation of memory in physical form becomes untenable. Working with photographs from a childhood spent on the dunes of Pacific City or the mouth of the Columbia River, Buswell’s “use of personal references […] points to my (and by extension, our) complicity and responsibility to living in the present…” In choosing locations with both deep personal meaning and historical importance, Buswell questions the possibility of a single, universal experience. Meanwhile in the courtyard, Mineo Mizuno will unveil his latest site-specific installation, formed from a 2,000 pound Oak tree. Confounding the standard relationship of sculpture and support, this installation warps the distinction between the found and the made, between artistic intention and the simple beauty of natural materials. This ‘intervention’ of porcelain combines Mizuno’s eloquent mastery of ceramics with the power of a refined artistic gesture. Seen as an outgrowth of his acclaimed static-angle observational films, Mizuno’s latest installation requires a certain stillness from the viewer, an investment in time in order to comprehend, rather than apprehend. Ben Buswell (b. 1974 in Dallas, Oregon) lives and works in Portland, Oregon. Buswell received his MFA from the University of Wisconsin at Madison, and BFA from Oregon State University. Notable solo exhibitions were held at The Art Gym (Portland, 2015), Upfor (Portland, 2015 and 2013), CoCA Seattle (2013), Helzer Gallery (Portland, 2010) and at TILT Gallery and Project Space (Portland, 2008). His work was included in Portland 2012: A Biennial of Contemporary Art at Disjecta Contemporary Art Center and The Oregon Biennial at the Portland Art Museum (2006). Buswell is a 2015 recipient of a Hallie Ford Fellowship in the Visual Arts from the Ford Family Foundation, as well as grants from the Regional Arts and Culture Council, The Oregon Arts Commission and Ford Family Foundation. His work is included in several private collections, including that of Jan and Patricia de Bont, and public collections of the Portland Art Museum, Portland Community College and the Oregon Health Sciences University and Portland State University Collaborative Life Sciences Building. Mineo Mizuno (b. 1965 in the Gifu Prefecture of Japan) studied at the California Institute of the Arts and Chouinard Art School in Los Angeles. 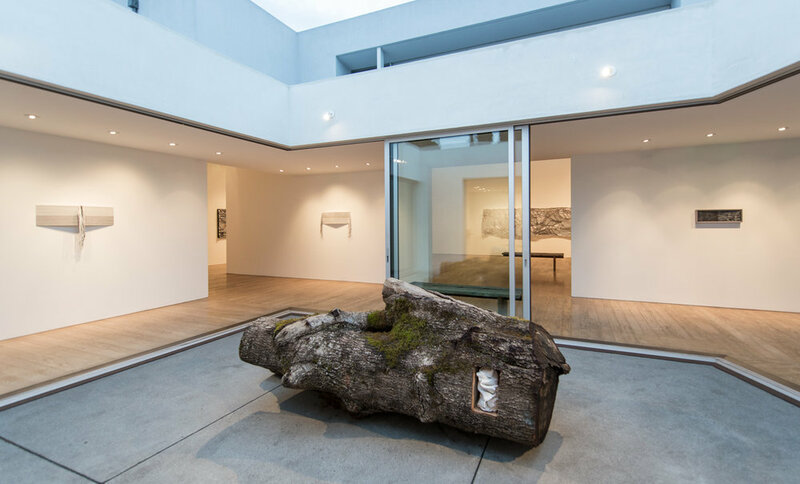 He has shown with Samuel Freeman since 2005, and was previously exhibited extensively in Los Angeles as well as Japan at Gallery Kouketsu (1989, 1992) and the Chac-Mool Gallery (1997). Group exhibitions of note include “Looking Ahead” at the LMAN Gallery in Los Angeles and “Color and Fire: Defining Moments in Studio Ceramic 1950-2000” at the Los Angeles County Museum of Art. In 1981, Mizuno was given an award by the National Endowment for the Arts. Public collections featuring Mizuno’s work include the Los Angeles County Museum of Art, the Long Beach Museum of Art, The Museum of Contemporary Ceramic Art in Shigaraki Japan, and the Hara Museum of Contemporary Art in Tokyo, Japan.